For the better part of the last decade, when a film opened with the words “directed by M. Night Shyamalan,” groans typically followed. Following smash hits in the early 2000s like “The Sixth Sense” and “Unbreakable,” Shyamalan produced several critical and box office flops that notoriously tarnished his reputation. That all changed however in 2016 with the unanticipated sequel to 2000’s “Unbreakable,” “Split.” The film shocked audiences as it received positive reviews and did surprisingly well at the box office. 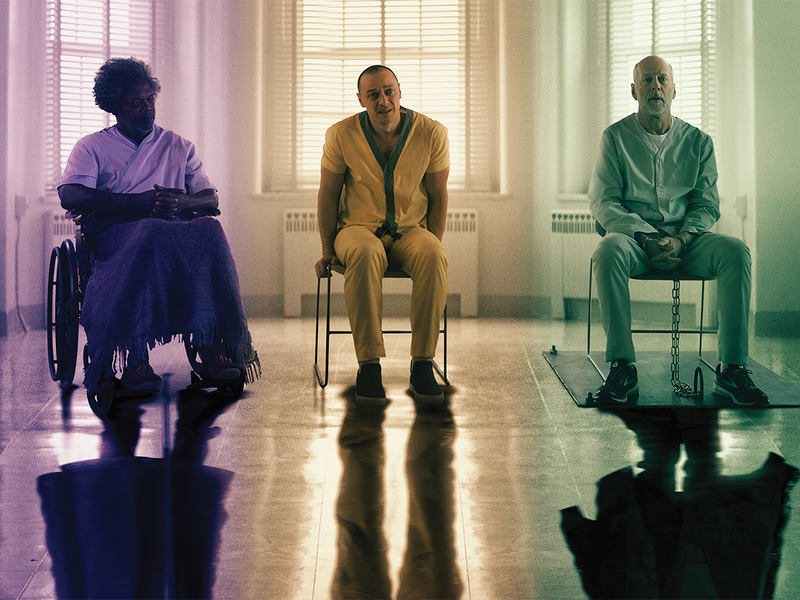 When it was later announced that Shyamalan would continue the story that began with “Unbreakable” and was continued in “Split” with 2019’s “Glass,” fans responded with enthusiasm. “Glass” picks up three weeks after the events of “Split” with Bruce Willis’ character, David Dunn, pursuing James McAvoy’s The Horde. The confrontation between the two superpowered beings is thrilling to watch. Rather than depict the fight as an expertly choreographed showdown as you would in a big budget Marvel or DC film, Shyamalan instead chooses to let the two characters brawl with each other as if it were any other street fight. However the scene is cut short just before its climax, when the two are whisked away to a psychiatric hospital to be cured of their superhero delusions alongside Mr. Glass, the heavily sedated mastermind played by Samuel L. Jackson. The therapy sessions that follow involve long and drawn out monologues from Sarah Paulson’s Dr. Staple as she tries to convince these three characters that they aren’t superheroes. For most of the film, Dr. Staple primarily acts as a ridiculous attempt by Shyamalan to convince the audience that everything we saw in “Unbreakable” and “Split” possibly wasn’t superhuman or unexplainable. As a result the audience never truly takes her seriously, despite the film’s character’s acceptance of that fact. The silver lining for these long and tedious therapy sessions are fascinating interactions between these three characters as we learn more about their inner working and desires. Though at times slow and tedious, the middle act provides entertaining bits of character work that justifies its existence. This film’s largest fault, however, lies within its ending. Following the team-up of the villains as teased in the trailers, the ending feels rushed and poorly executed. The duo’s escape from the mental hospital occurs with little resistance as The Horde literally tears through everyone in its way. Furthermore, the staging of the final climactic fight between Dunn and The Horde feels bizarre and extremely convenient. With the entire cast showing up to watch, the fight feels more like a scheduled pay-per-view match rather than a natural progression of the plot. The biggest problem with the ending, though, comes with the anticipated twist Shyamalan is known for. In previous Shyamalan films, the twist feels deserved when the audience pieces together all the clues that were left for them prior to the reveal. “Glass” has none of that. The ending twist is shocking because there are no subtle hints or plot points prior to it that justify its existence. The revelation is confusing and annoying, especially when one considers how neatly things were wrapped up, without any explanation as to how it came to be. The supporting cast, however, is where the performances begin to falter. Sarah Paulson manages to deliver a respectable, albeit not impressive, performance as Dr. Staple. But she never truly leaves an impact since she only really exists to try and convince us that these characters aren’t superhuman, even though we know they are. The fact that someone might be skeptical of these characters’ abilities is an interesting avenue to explore, but the film never takes advantage of that idea. Instead, while Staple gives her long and drawn out monologues that try to convince the core trio that they aren’t comic book characters, Shyamalan continues to portray each of them as superpowered beings capable of everything Staple is trying to disprove. Furthermore, when Staple’s motivations are revealed in the final act, they come as such a surprise that they feel cartoonish and unjustified as they tie into the disappointing twist. The return of Mr. Glass’ mother (Charlayne Woodard), and Joseph Dunn (Spencer Treat Clark) from “Unbreakable” are unimpressive and poorly performed at times. The biggest disappointment in terms of returning characters though is with Anya Taylor-Joy’s Casey Cooke from “Split.” In “Split,” we last see Cooke as she is being sent back to her abusive uncle after having survived being held hostage by The Horde. When we next see her in “Glass,” three weeks later, she has moved on to a loving foster family and appears to have no real lasting trauma. As a result, it feels like Shyamalan lost interest in her and decided to just throw in a quick resolution for what was a great character. Verdict: “Glass” delivers on stunning performances from its three main leads, especially James McAvoy, and a great opening, but fumbles the ball as it continues. An unearned end revelation and poor performances from the supporting cast make for a disappointing and upsetting end to this otherwise compelling trilogy.